The perfect retreat for friends and families traveling together, this gorgeous condo features 4 bedrooms, 4 full bathrooms, and comfortably accommodates up to 8 guests. A tropical Belize escape awaits you at Vista Caribe. 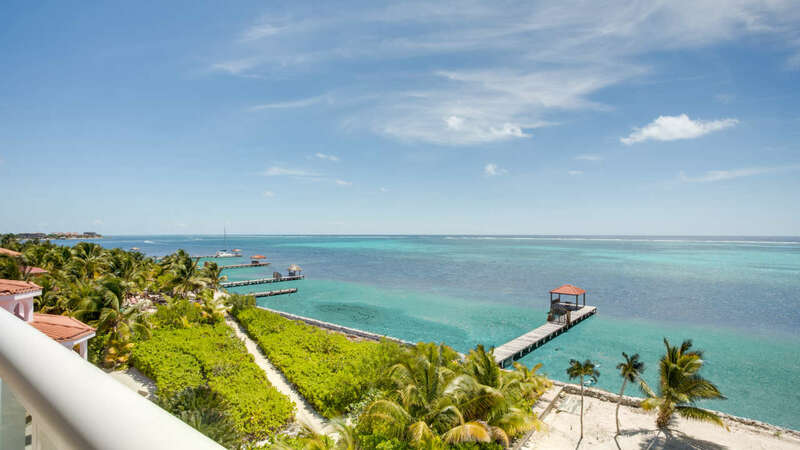 Relax and enjoy views of the sea from your private balcony, hop in the golf cart and explore San Pedro or paddle out to a coral reef and snorkel with the fish. Step off the elevator and luxuriate on your own private floor. The open concept of the home ensures you will not miss the views of the sea while relaxing inside. Gather in the living area and take in the stunning sea views through the floor to ceiling windows. Just off the living area is a private balcony. Relax in the outdoor lounge chairs while watching the sunrise and set over the vast sea. The gourmet kitchen is the perfect space for creating your next decadent meal or entertaining guests. The large island is the perfect spot to gather and enjoy appetizers before dinner with the reef still plainly in sight. The formal dining area is just off the kitchen and can comfortably seat 8 guests. Or skip the formality, take the meal outside to the dining table on the second private balcony and dine al fresco beside the sunset. Continue through the home to the well-appointed master suite. A great night’s sleep in the king bed will be easy with the soft sounds of the sea in the background. The master suite also has its own private balcony and hot tub, a TV, and an ensuite bath with dual vanities and an expansive wrap-around shower. The second guest suite features a king bed, balcony access, a TV, and an ensuite bath. The third guest suite features a king bed, a TV, and an ensuite bath with dual vanities and a large soaking tub. The fourth guest room has a king bed, a TV, and a separate full bathroom in the hallway. The amenities at Vista Caribe are everything you could desire on Caribbean vacation. Relax by the pool and then challenge your friends to game of volleyball on the court. Take the kayaks out to the tropical reef and swim with the fish. Give yourself a break with a soak in the private hot tub. Then jump in the golf cart and go out for a night on the town. The condo is only minutes from the town of San Pedro, where you’ll find the island’s best beach bars and restaurants. The Hol Chan Marine Reserve is just South of San Pedro. Save a day for a snorkeling adventure on a coral reef with hundreds of different sea creatures or explore Shark Ray Alley and see stingrays and sharks in person. It’s time for your Caribbean getaway. 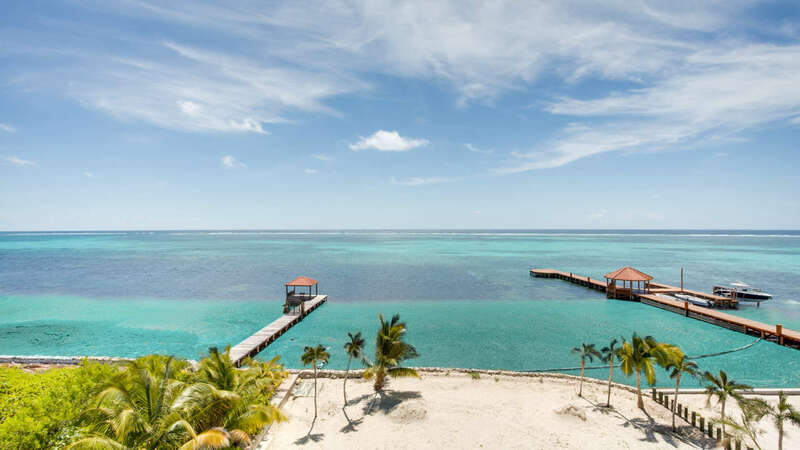 Vista Caribe is the ideal spot for your next trip to tropical Belize. 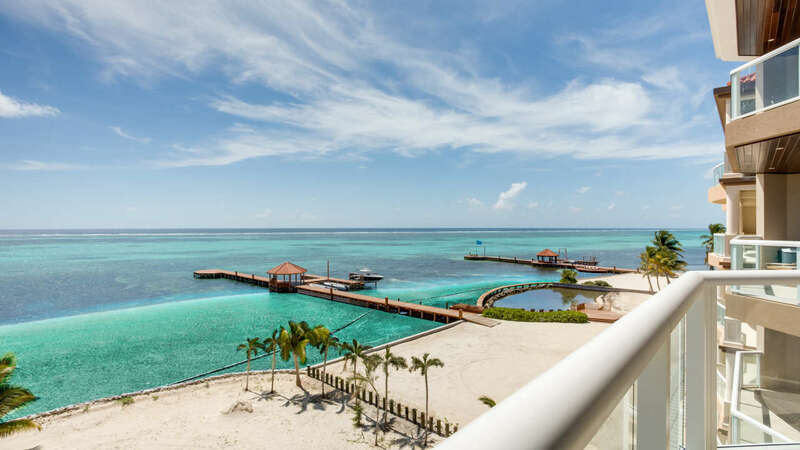 Whether you’re touring the town of San Pedro in your private golf cart, kayaking the coral reef or relaxing by the pool, this condo has everything you need for your dream tropical vacation.